Memory Lane Friday is a weekly blog carnival where you can blog about your memories and link up. Some weeks have themes, this week does not. Everyone is welcome! How many of you can stop what you're doing, remember your grandmother's house, and smell it in your memory? I can, I can smell the moment I walked in the door. Five years old and engulfed in the smells of home cooking and heavy brocade curtains and my grandmother's lotion. After all the hugging business was out of the way, my young legs would carry me to the slippery peach couch perched on ornate wooden legs. That was where the visiting would take place, as I kicked my legs back and forth, but of more important interest to me were the side tables. Of which the peach couch had two. 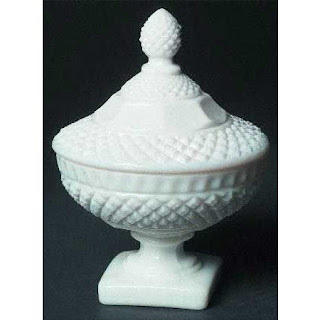 On one side was the rounder candy dish and on the other side the more square dish. And I knew a secret. See, everyone went for the round dish. The square dish was forgotten. 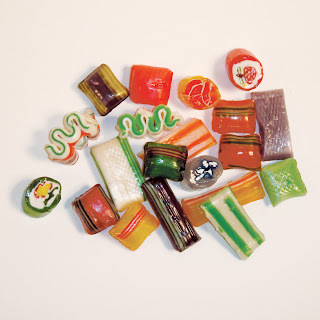 So although I, too, was drawn to the attractive round dish, I knew that the best candies were in the square dish. It always had a better selection. Sometimes, my grandmother would think about it beforehand and top off the candy for me before I even arrived. There were a few types I didn't care for, but mostly sugar was sugar and I wasn't too picky. They'd dissolve slowly in my mouth as I listened to conversations in the room. Sweet chatting. As I grew older and became a pre-teen, sometimes the candy was forgotten, and I'd be the only one to remember to check the dishes. I'd find the candies stuck together and stale. I never said anything about it though. In retrospect, you can find so many little signs of Alzheimers in the memories of small daily life moments. Want to link up to Memory Lane Friday? Just add your website to the link up below. Please take the time to visit the other websites as well! Come back next week. The topic is "A Store"
My grandmother's square dish held the candy. It was milk glass too. It held a mixed of Brach's candies. there are SO many things that bring me to my grama's homes ..... smells are a huge one for me but we had the candy dishes too! I enjoyed this memory about your grandma, but I was sorry to read about her Alzheimer's. Such a terrible illness. My grandma had the same kind of dish--and the same kind of candy! Oh, how I loved it! And that is still my favorite candy to this day! Oh wow. Lisa, we have so many similarities. My grandmother had Alzheimer's, as well. Her "candy" was tootsie rolls, though. ;) And my great grandmother (on my mom's side) was in a nursing home and she always had coffee candies for us. Thanks for bringing this memory back to me! I love love this candy!! I remember going to my great grandmother's house the most. I don't remember candy, but I do remember she had toys hid in everyday type things around the room. There were balls hid in a big round milk thing, no idea what it was called. In the closet was Lincoln Logs with farm animals. She also had a piano that I used to play when we would go to her house. I also remember her couch was slick to sit on! You had to work to keep from sliding off it! lol Oh, and she had a shelf behind her chair where she hid her snuff! WOW~! I loved my gramma's.. One always greeted you with hugs, hugs,hugs and kisses and "HiHiHiHiHI". This Gramma always had ice cream. My other gramma was more stiff ,,,she was happy to see you but just a hug and no kiss. and She had no candy, cookies or anything to offer. Of course you know which Gramma I loved going to the most. You have a Tiggeriffic story today about your Grandma.. Enjoy you so much..
My grandparents house is FILLED with those types of glass dishes. Literally, it's everywhere. Probably still filled with the same candy from 20+ years ago. Love this post, totally took me back to my childhood. What a great memory about visiting your grandmother. Fun stuff! What wonderful memories of your childhood and grandmother. Now I want candy! My grandfather had Alzheimer's and looking back, our first clue was him constantly losing his keys ... now if I ever lose my keys I worry! My grandmother didn't often have candy at her house, but when she did...it was that ribbon candy that you have pictured. She kept hers in a crystal bowl in the living room. I remember sitting in there, reading a book, and eating it. Very sweet. My grandparents died when I was very young so I barely remember them. How wonderful it must be for you to have memories of your grandparents. I love that ribbon candy, I still buy it when I see it in the store...usually around Christmas time.